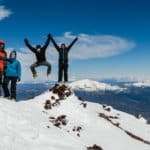 Ski down the slopes of the stunning volcanoes in Chile (Lonquimay, Llaima, Villarrica, Mocho, Osorno) in this 9-day trip with Nicolás, IFMGA certified guide. 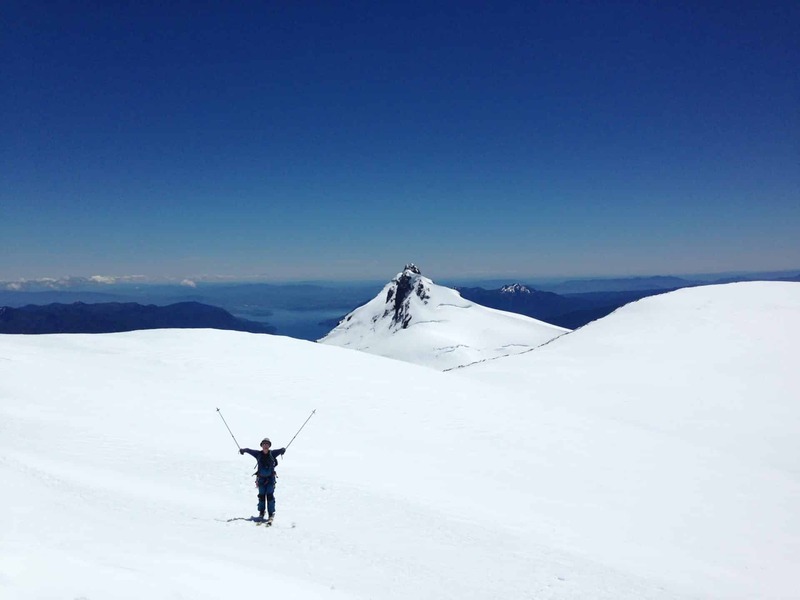 Join me for a long week exploring the slopes of the southern Chilean volcanoes by ski touring. 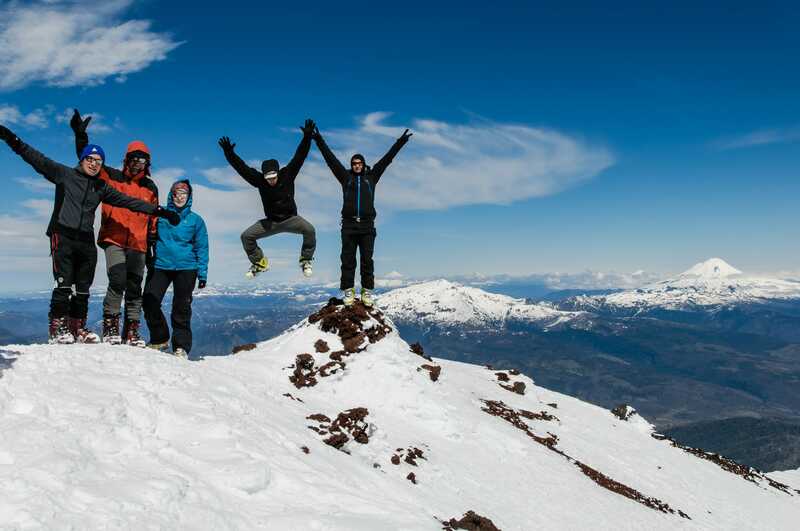 In this amazing trip you will discover the Araucania, rivers and lakes district of Chile. The trip takes you through active volcanoes and incredible trees like the old araucarias. In addition, you will enjoy delicious local food, hot springs, the local culture and other unforgettable memories. 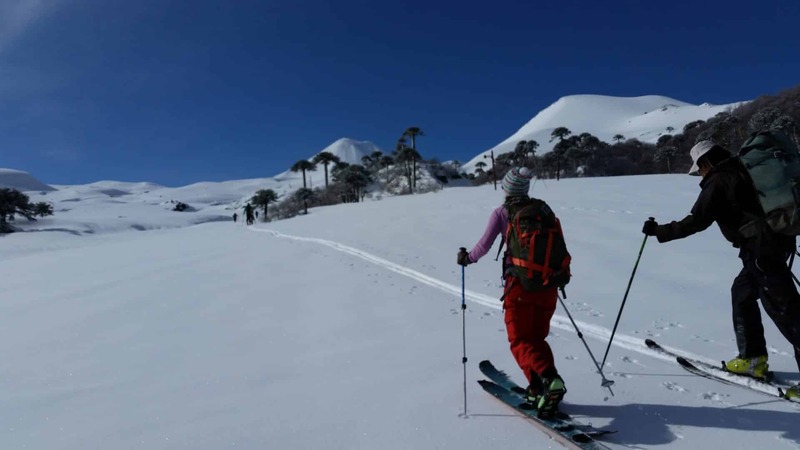 We will ski down 5 different volcanos: Lonquimay, Llaima, Villarrica, Mocho and Osorno. Each of them has a very different shape. It will therefore make for unique descents. Moreover, the landscapes and views of the region are stunning. During this trip we will discover the ancient forest of the area, the big rivers and lakes. It will also be a chance to live the culture and enjoy the great food of the area. We will sleep in different lodges and hotels close to the mountain. 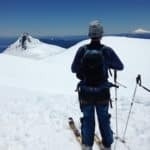 The idea is to discover the region by skiing down the volcanos, eating good food and resting in beautiful places every day. Did you find this trip interesting? Then please contact me to organize your next adventure in the Chilean Patagonia! We meet at Temuco airport to begin our trip. We travel 2 hours to Malalcahuello, where we will sleep in the hostel at the base of Lonquimay Volcano. We start early with a 1 hour drive to the base of Llaima volcano. 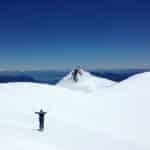 Then we will do a long and easy plateau before climbing up the cone that will take us to the summit and crater of this beautiful mountain. 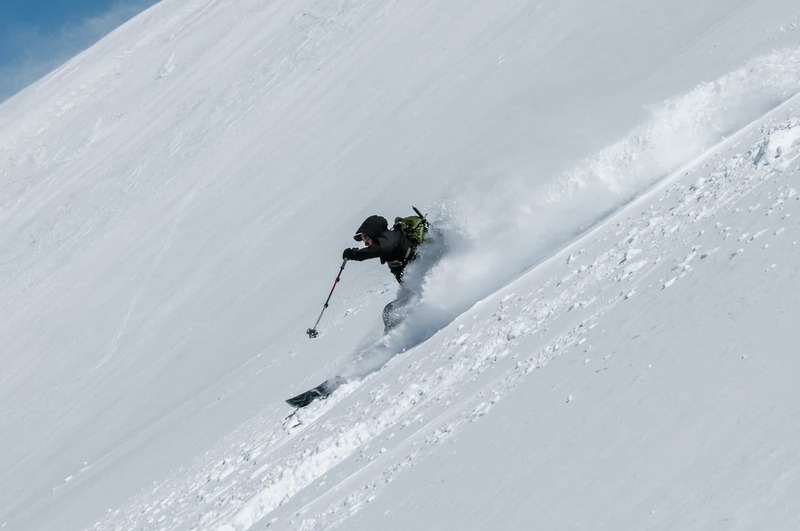 It takes around 5 to 6 hours up and 2-3 hours skiing down. We move from the Llaima area to the city of Pucón. There you will have the option to go to hot springs or visit the city. 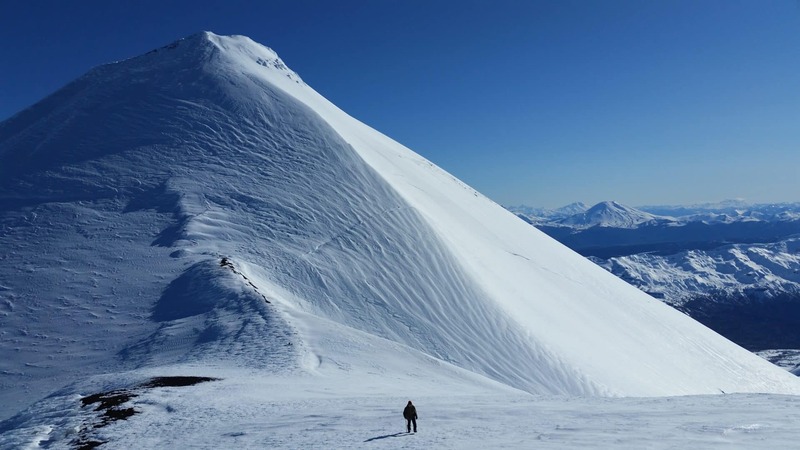 A 40 minute drive will leave us at the base of the volcano, where we will begin going up during 4-5 hours to arrive to the top of this active cone. If we are lucky we will see the lava and the activity of this beautiful mountain. The way down is easy by long slopes of snow. 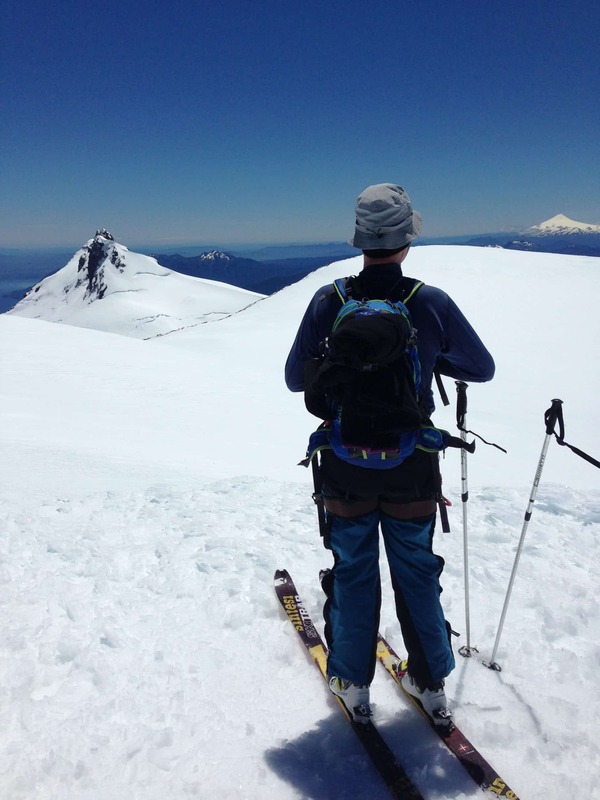 We start early from Pucon and we drive 2 hours to the south to climb in the Mocho-Choshuenco massif. It’s a beautiful and different volcanic massif with 2 summits. We will try to go up the Mocho by 3-4 hours of climbing and a relaxing descent with outstanding views. We will sleep in Neltume, where we can visit the lakes of the area and the different waterfalls of the Fuy river. We do a 4 hour trip to Puerto Varas city, where we will enjoy the afternoon with a good dinner and views of the lake and the volcanoes. We drive 1 hour from Puerto Varas to arrive to the base of the volcano. We will do 4-5 hours going up. In the last part we will take off the skis to climb up to the top (45º). This volcano doesn’t have a crater because there is a glacier on it. The view from the top is something you have to see yourself. From Puerto Varas we go to Puerto Montt, 30 minute drive, where I can leave you at the airport. 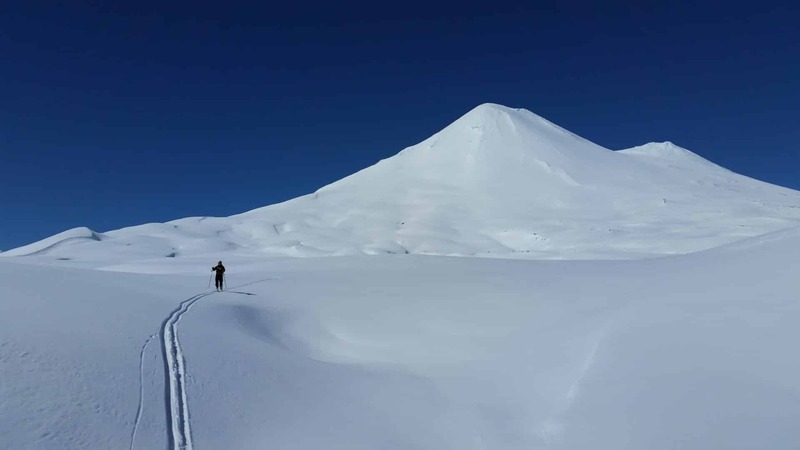 What to bring: your complete ski equipment (alpine touring), ice axe, helmet, warm mountain clothes, gloves, headlamp, sunscreen, sunglasses and personal items. If you want you can rent part of the equipment here in Chile. UIAGM/IFMGA mountain guide from Chile. 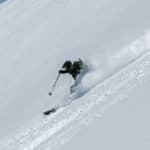 The mountain is my life, every time I ski, climb or walk in this incredible environment I am happy and I find the beauty of the world. 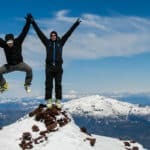 I think, like mountain guides, we have the best work in the world, we take people through this wonderful terrain and we enjoy discovering together. More than 12 years ago I got into the mountains, this took me to travel to different places around the world. 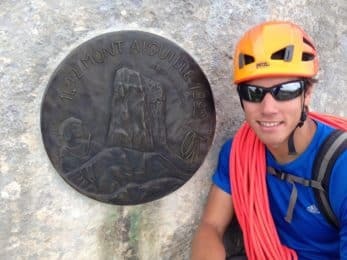 I have been climbing in Peru, Bolivia, Argentina, Brazil, Mexico, France, Italy, Switzerland and Spain. I have done long expeditions to Aconcagua, Marmolejo and another 6000’s, I have climbed and guided the classics of the Alps like Matterhorn, Mont Blanc, Monte Rosa, Lyskamm, and I have ski mountains in the Alps and volcanoes in the Andes. I first studied 3 years in Chile in the national school of mountaineering to become a local mountain guide (ACGM). 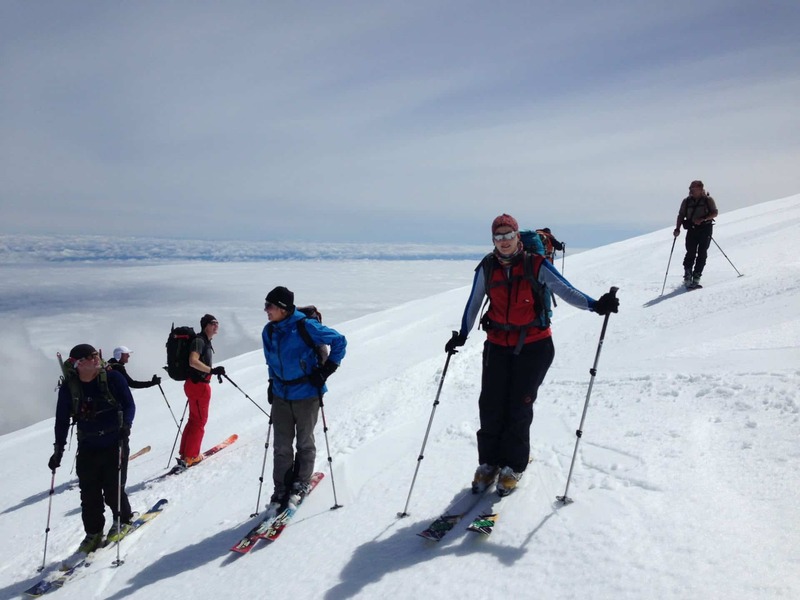 I did the training to get the international license of mountain guide (UIAGM) in Bolivia and I completed the ski training in France (ENSA). I speak Spanish, English and French fluently. I also can speak a little bit of German, Italian and Portuguese. See my programs, contact me and I can take you to discover the mountains and to have incredible moments!